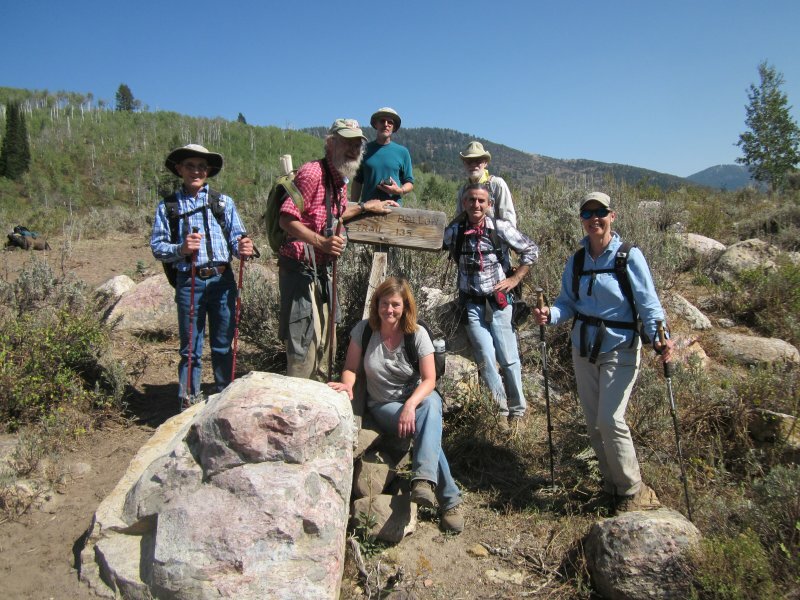 This was the first time any of the participants actually hiked on this trail. Eight people joined the hike; Dan (the leader), Dave P., Dave W., Jane, Denis, Deanna, Gordon and Reinhard. After meeting at our usual spot in Logan, we formed carpools and drove up Franklin Basin road to the location indicated on our topographic maps. The Logan River is shallow here so we were able to cross by stepping on rocks, and we followed a cattle trail downstream along the route shown on our map before we encountered the actual trail almost 1/2 mile from our start. This obviously is an old trail, deeply worn by decades of past use. Recent stock and game traffic has turned the surface into dry, powdery dust that drifted into the air as we walked. The trail was well-maintained for the first 2 or 3 miles, with evidence of recently cut logs. Lower Peterson Hollow is gently sloping and shady. It changes to open sagebrush terrain and finally aspen trees, where fallen logs lay across the way and the trail morphs into a branching cattle path. According to our map, the trail continued another 1/4 mile toward the northeast, but we left the indicated route and followed a cattle path directly to Wiggler Lake, our destination. 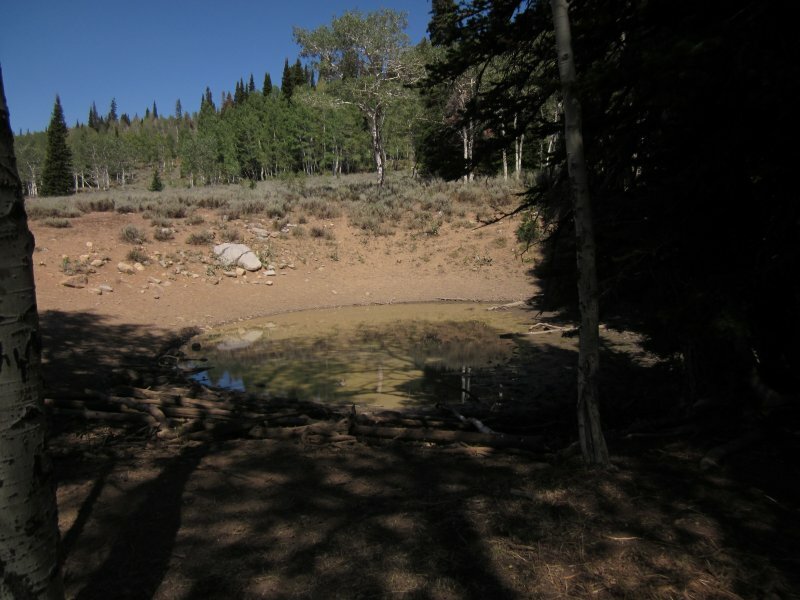 Wiggler Lake appears to be a sinkhole with murky water in the bottom, but it obviously is an important water source for livestock and game. Animal paths, like the one we followed, arrive here from many directions. Archery deer season is underway - there are portable stands in trees overhead and area reeks with the musky smell of "deer scent" (apparently placed here by hunters to mask their scent and to attract deer). The "lake" didn't seem like an pleasant place to eat, so we went a short distance south to a rocky overlook for lunch-with-a-view. Beaver Mountain dominated the view toward the southeast, and we spotted Gog, Magog and Naomi toward the southwest. After lunch we went back almost the same way that we came. Upon reaching the lower end of Peterson Hollow, however, we stayed on the main trail, straight down to the Logan River, where we found the sign "Peterson Hollow Trail 135". Next time we will start here, which promises to save 3/4 mile off the total trip distance (see our route on the map, below). It was easier to cross the river here, too. This was an enjoyable hike. We saw an elk, a Clark's nutcracker, several ruffed grouse, a carrion beetle and a Mormon cricket along the way! (We saw cows, too, but these don't count). Our trip totaled 1500 feet of elevation and 8.6 total miles. The weather was excellent, with a clear sky and moderate temperature. It was a moderate-level activity, with an interesting destination and varied terrain. We think a mid-summer hike would be better, however, with the promise of wildflowers and less evidence of cattle grazing. Peterson Hollow could be a pleasant winter snowshoe or cross-country ski route, although the area is designated for motorized winter recreation.